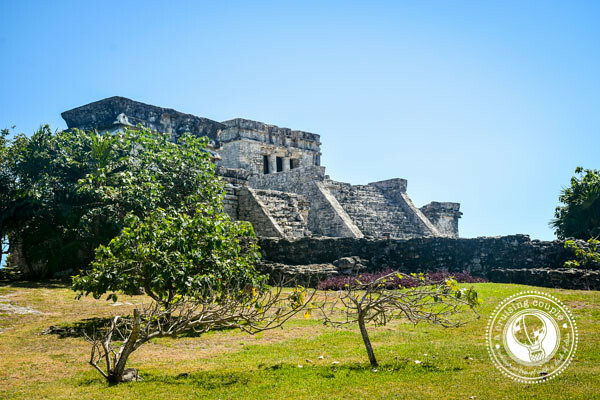 No trip to Mexico is complete without a visit to at least one Mayan ruin. Of course, if you can see four…that’s even better! One of the greatest civilizations of Mesoamerica, the Mayan civilization is known for its hieroglyph writing, architectural feats, and impressive astrological and mathematical knowledge (which produced an astonishingly sophisticated calendar system). Mayan influences are scattered across Mexico and Central America, not only in the form of ancient ruins, but also the millions of descendents of Mayans who continue to speak Mayan languages today. 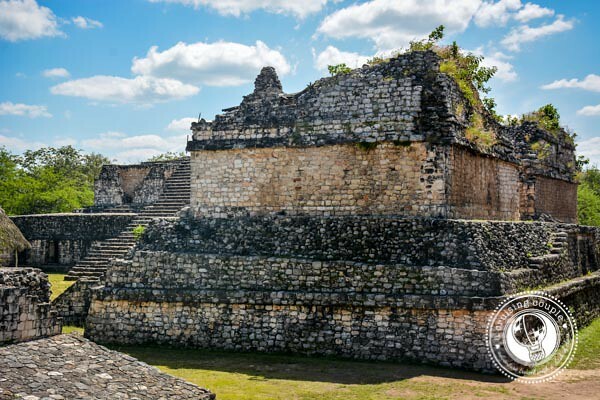 Ek Balam is new to the tourist scene, archeologists having only begun restoration in 1997. However, the site itself is anything but new; Mayans are thought to have occupied it sometime between 100 BC and 300 AD, and the civilization was at its height in the Late Classic period, 600-900 AD. Only the center of Ek Balam has been excavated. Of this, the Acropolis Temple is the most impressive at 95 feet tall. Visitors can climb the six levels to the top of the Acropolis for a fantastic view. Though it’s a bit of a trek—and not so good if you’re scared of heights—this is definitely the best way to appreciate the temple layout. Don’t miss the rare and original sculptures under the thatched roof on your way up. The two hills viewed from the top are actually two buildings yet to be excavated. Because the restored portion is relatively small, and the site itself is relatively new, Ek Balam doesn’t see nearly as many tourists as other Mayan temples. There are no hawkers trying to sell you mass-produced souvenirs, no fellow tourists bumping into you as you wander the grounds. It was as though we were transported back to ancient Mayan civilization, with only the occasional sunbathing iguana to distract us from our reverie. It only takes about 1-2 hours to explore. There is one restroom outside the site, and limited refreshments and food. There is a nearby cenote you can visit, though we did not. The site is open daily from 8am-5pm; foreigners pay 172 pesos to enter. Chichen Itza is perhaps the most popular of Mayan temples. 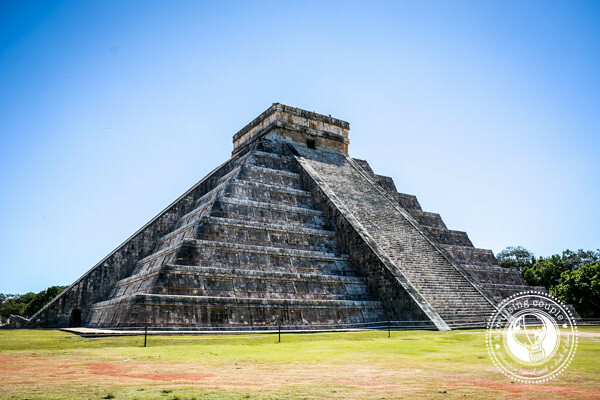 It was first brought to attention in the book, “Incidents of Traveling the Yucatan”, and today is considered one of the ‘New 7 Wonders of the World’. Chichen Itza is consistently crowded and feels extremely touristy, largely due to the rows of vendors selling memorabilia (including an extremely annoying toy that mimics the sound of a jaguar). 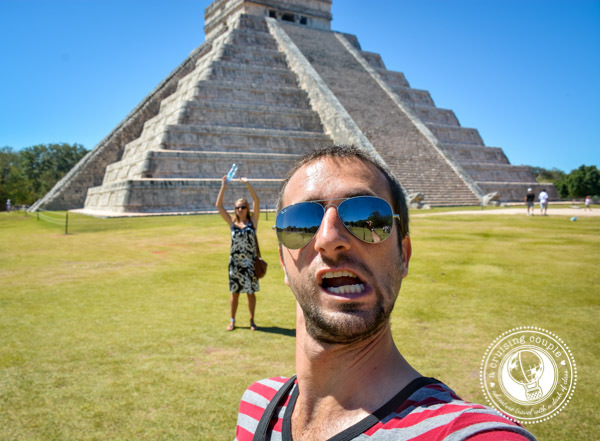 But like most attractions, Chichen Itza is touristy for a reason. If you’re prepared for that, you’ll likely find the ruins maintain a dazzling appeal. Chichen Itza is a fantastic example of post-classic Mayan civilization. 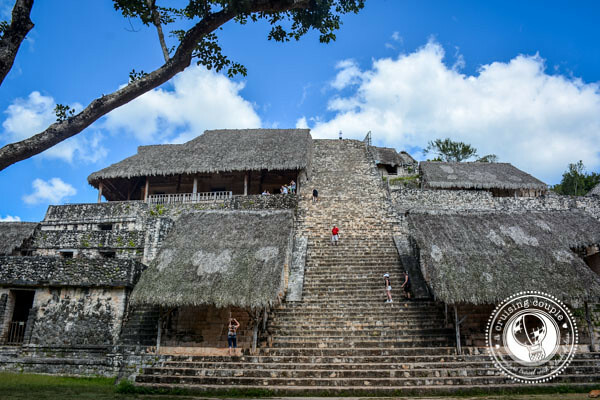 Rather than a pointed top to the main temple (like Ek Balam and characteristic of the Classic Period), you’ll find a flat roof. Though it’s likely that Chichen Itza thrived nearly 600 years after Ek Balam, it became one of the largest Mayan city-states. This is the large central pyramid; it’s impossible to miss at 98 feet high, and it’s likely you’ve seen photos of it before. The temple wasn’t always that tall though. Mayans would typically make their temples larger by superimposing one upon the other. Inside El Castillo is actually a smaller pyramid with a statue to the god Chac Mool. Unfortunately, it is no longer possible to go inside the pyramid to see it. El Castillo has 365 steps, one for each day of the year. There are serpent heads at the base of the steps. 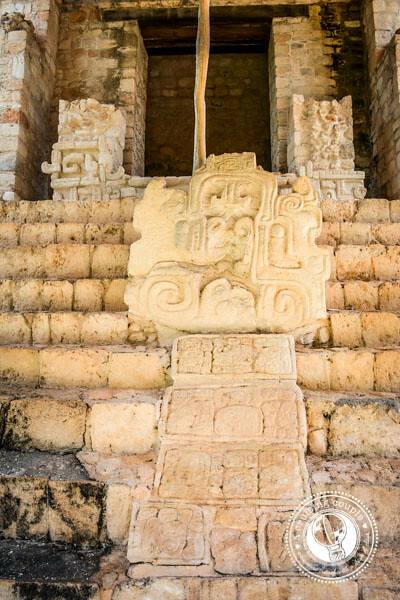 During the equinoxes a shadow appears on the stairs, creating the image of a snake from top to bottom—an absolutely fascinating portrayal of ancient Mayan astronomical knowledge. The ball court at Chichen Itza is the largest and best preserved in the Americas. The games not only served as entertainment, but also as a ritual for the underworld. The rules are not known exactly, but most think that players used their hips to hit a 10lb rubber ball through the stone hoops on the side of the court. 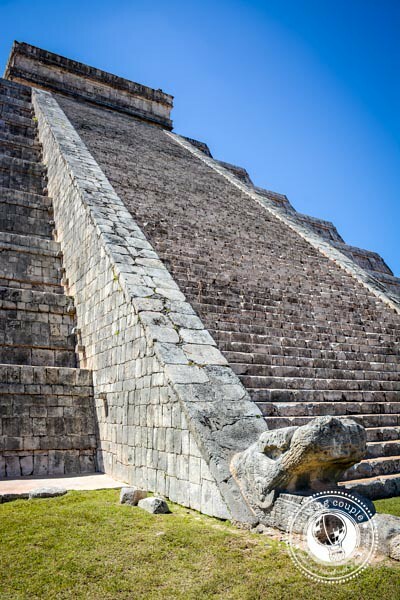 However, judging by the height of the hoops at Chichen Itza, there were likely variations to these rules. Competition must have been intense as losers of the game were often put to death, a sacrifice for the gods. There is no shortage of cenotes to see in the Yucatan peninsula, but this is definitely one of the most famous. 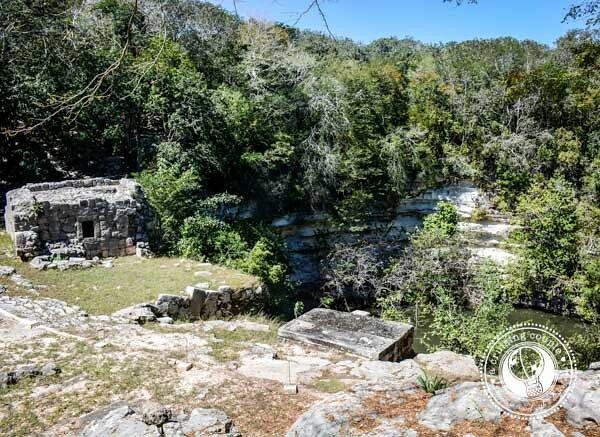 The Cenote Sagrado is a place of pilgrimage for Mayans, and historically a place to conduct sacrifices during droughts. You’ll likely see tourists clapping their hands around El Castillo. This is because the acoustics of the ruins are so that you’ll hear on echo, said to mimic the sound of a quetzal. Chichen Itza was the principal ceremonial center of the Yucatan. There is much to discover, and we felt our knowledge of Mayan culture greatly enhanced by a visit. Also, it made us think of The Emperor’s New Groove, which was kind of fun. Arrive early. The site gets extremely crowded in the afternoon. 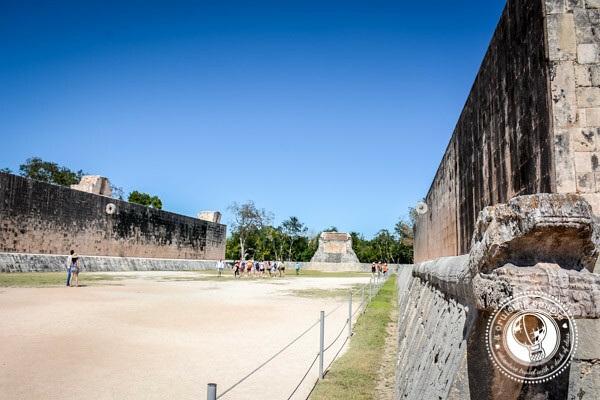 You can no longer climb to the top of El Castillo as a safety precaution. Admission is from 8am to 5pm and costs around $15 USD (196 pesos or so). The fee includes entrance to an evening light and sound show, where the acoustics and serpent shape are demonstrated. While Coba wasn’t our favorite temple, it is unique in that it contains the largest Mayan pyramid at 130 feet. Even better, you can climb to the top for a fantastic view of the temple grounds, intricate network of ancient roads, and vast surrounding landscape. The name ‘Coba’ means water stirred by wind; it is named for its prime location amongst two lagoons. The bulk of the temple was constructed during the Classic Period, though it’s possible that the temple was occupied as late as Spanish arrival. While you’re walking through the grounds, take note of the ancient roads, called sacbe. They were constructed of white rock, which would reflect moonlight at night, serving as a sort of flashlight. The roads also demonstrate that Coba was an important trading link between the coast and cities inland. 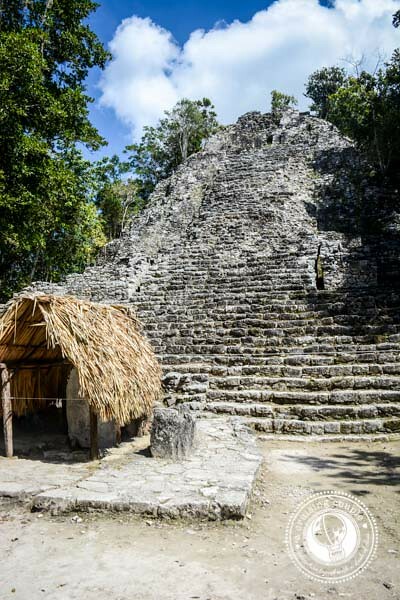 Most of our knowledge about Mayan culture and temples came from our brilliant tour guide at Coba with Alltournative. Though we only did the tour of Coba with the company, a lot of the information was directly applicable to the other temples we visited. Included with the two-hour Coba trip was an excursion to a traditional Mayan village, where we adventured through more cenotes, participated in a traditional Mayan ritual led by an actual Mayan shaman, and enjoyed a typical Mayan feast. While the ‘adventure’ side seemed to be lacking a bit of energy, the interaction with the Mayan community was memorable and enlightening. 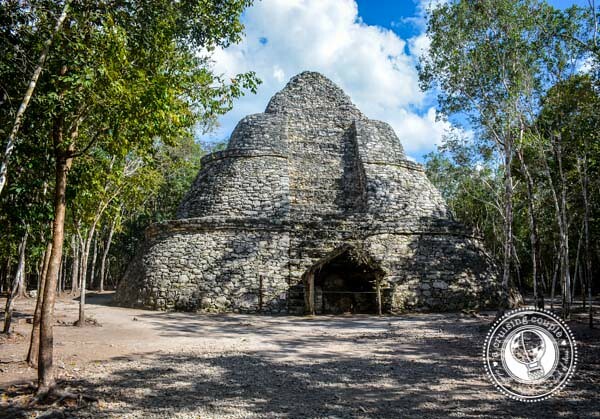 If you visit Coba with Alltournative, you can feel confident that you are giving back to the local Mayan population that still lives in the Yucatan. Unfortunately, many Mayans today live in poverty. One local told us that all-inclusive resorts send buses to Mayan communities to pick up the men and transport them to the hotels, where they work 12-hour days for just a few dollars. They return on the weekends to spend time with their families, but the income is barely enough to provide for them. 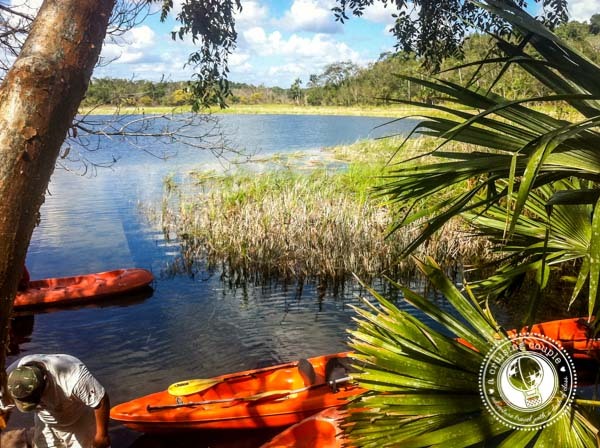 However, Alltournative is offering a solution; they are going into the communities and working with the locals, creating eco-friendly attractions without changing the integrity of the environment, and then employing the locals to run the facilities. The sustainable development of the Maya communities is supported by agreements made with community groups, or ejidos, where the communities are committed not only to achieve social and economic development, but also to avoid logging and hunting in the areas visited by tourists and beyond. You can read more about Alltournative’s commitment to sustainability and the difference they are making in the local communities here. 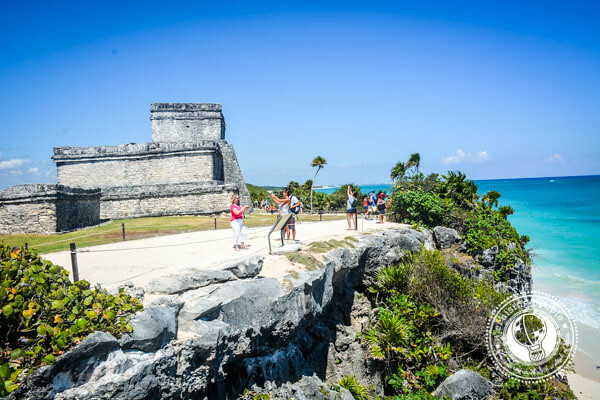 After participating in the ‘Coba Maya Encounter’, we can say that Alltournative is living up to the high standard it has set for itself. 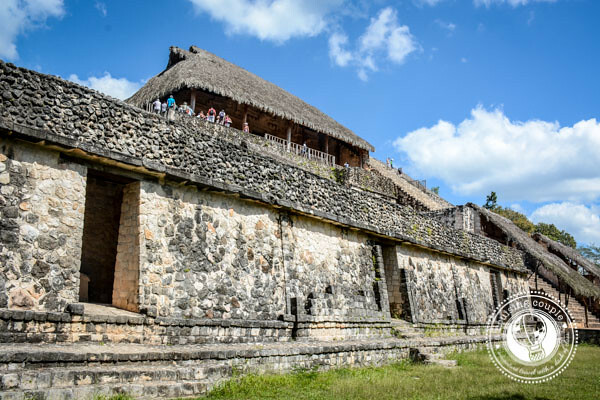 If you want to learn more about the lasting legacy of Mayan culture, this is definitely the tour for you. 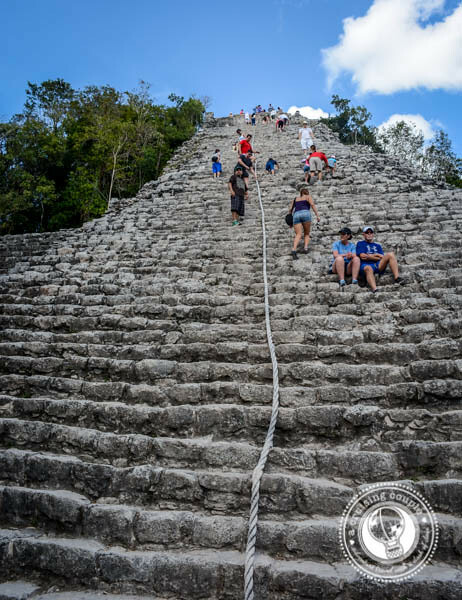 Coba doesn’t get as crowded as Chichen Itza, but arrive in the morning or late afternoon to avoid the intense heat while climbing all those stairs! There are bikes available to rent, which we recommend as it is quite a long way to access the main temple. The tour with Alltournative costs $139, and includes transportation, lunch, Coba admission, guide, and adventure activities. The admission for Coba alone is 57 pesos; the site is open from 8am-5pm. The Mayans sure knew where to build their temples. 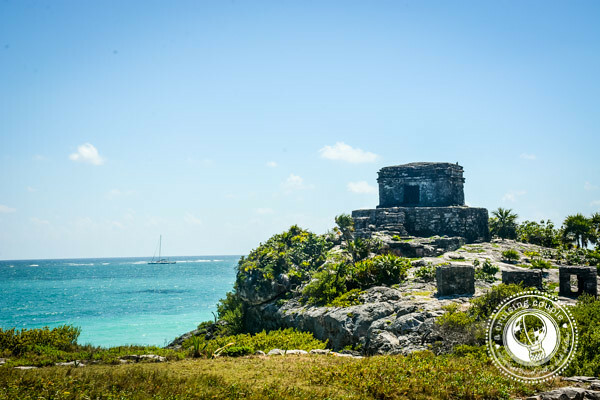 Tulum is located on a dramatic cliff overlooking the Caribbean Sea, and it is simply gorgeous. By our visit to Tulum we were a bit Mayan-templed out, but this one was worth it for the setting alone. 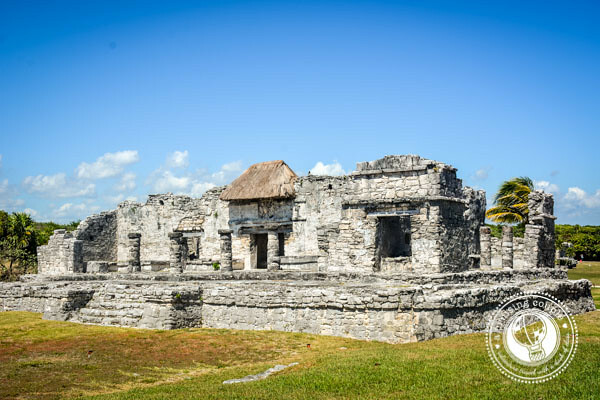 Tulum was a walled city, likely a temple, trading port, and navigational guide. From the main shrine, El Castillo, there are small windows that line up perfectly with a gap in the barrier reef offshore. Boatmen could line up their canoes with the windows to provide safe incoming through the reef. Additionally, the Temple of Frescoes is one of the most unique Mayan attractions of all the temples; the frescoes are a magnificent depiction of Mayan artwork, and it is still possible to see some of the original coloring of the pictures. Much of what archeologists know about Mayan temple décor comes from this site. Bring your bathing suit! There is a beautiful beach at the base of the temple. It gets hot walking around the grounds, so you’ll definitely want to cool off here. I mean, do we even have to say it? Look at that view. Admission is 35 pesos. Like all the temples, it is open from 8am to 5pm daily. You can breeze through the site in 30 minutes if you just want to take in the view, or spend an entire day learning about the temple and enjoying the grounds. 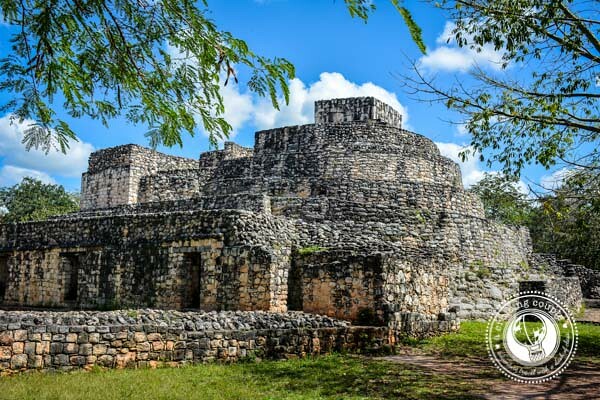 We had plenty of time to devote one day to each of the ruins, but if you are up for a long day, it is possible to combine Ek Balam and Chichen Itza into one daytrip and Coba and Tulum into another. If you are spending time in Cancun, don’t forget to add the Maya Museum into your itinerary. It will greatly add to your experience at the temples. And again, Alltournative is a good way to support the local economy. Try to avoid visiting the sites on Sundays—admission is free to Mexicans, and the temples can get very busy. We were guests of Alltournative for our Coba Encounter. All thoughts and opinions are our own. Have you visited any of these temples? Which one looks the most interesting to you? Any fascinating facts about Mayan culture that you would like to add? I’ve only seen Chichen Itza and that was a few years ago but I’d love to go back and see the Tulum ruins next time! 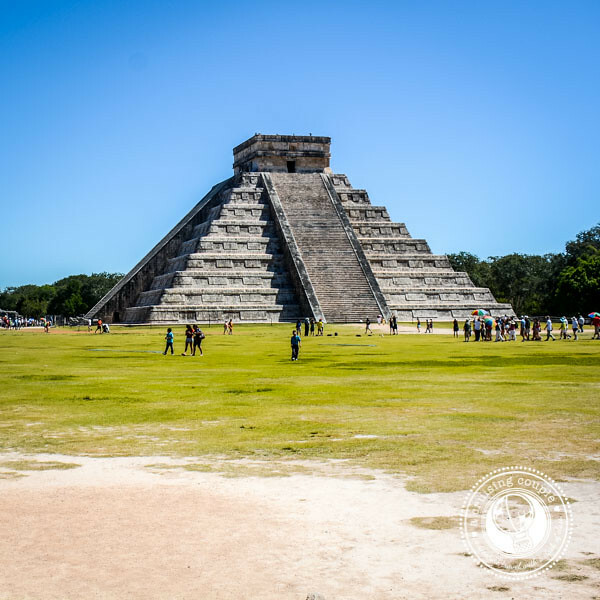 We visited Chichen Itza and Tulum – both well worh seeing. We went on a tour to Chichen Itza which packed alot into one day but an excellent way to get a taste of a few things. 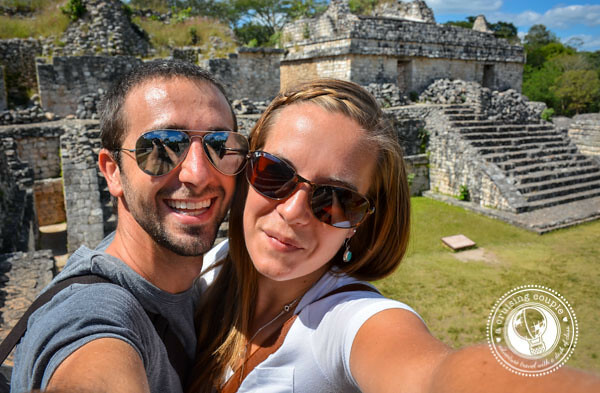 We visited a Mayan village, a cenote, the ruins and Valladolid-a colonial town. The drive there and back was interesting in itself. We visited Tulum on our own- smaller but so incredibly beautiful by the sea. 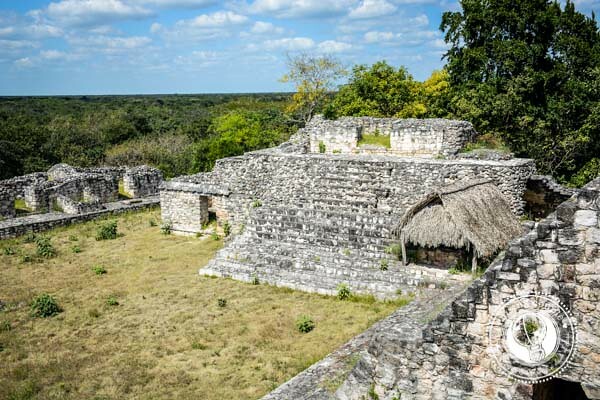 After this article you have made me want to see Ek Balam, maybe next time! Where did you stay that you were able to see all those ruins within a few days? 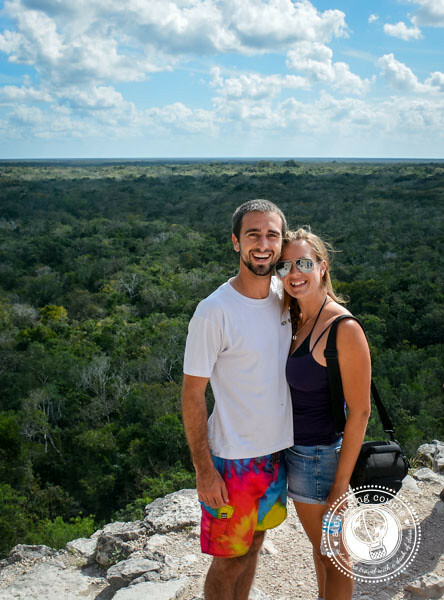 We travelled around the Yucatan over our trip :) We were able to see all these on a trip to Cancun, Tulum and Valladolid. The Laminai ruins in Beliz are far more impressive than anything I have seen in this part of Mexico. Go to Orangewalk and book with the Jungle River Tours. It is a boat ride up the Nuw River and a guided tour of the ruis. Worth every bit of your time. 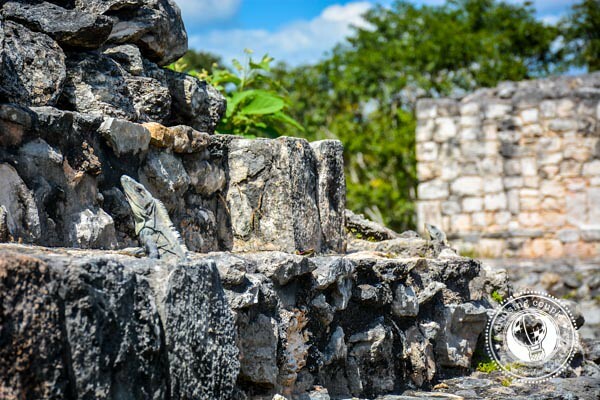 I like the sustainable side of visiting Coba, it’s important to know that you are giving it back to the local population I also like about Coba the fact that isn’t as crowed as the others. Loved Casey’s descriptions of the temples in this post. Makes me feel that I went there with you. And Dan’s pictures bring it all to life!! Great blog! Thanks for sharing. Love this post and Mayan ruins. I have been to Chichen Itza and Tulum. Can’t wait to go back to Mexico to check more ruins (like Palenque and Uxmal). I’ve never been to any of the ruins in Mexico. But, I would say the 4th one would be the one I would want to see. Tulum is pretty special for it’s location. You could spend the whole day there wandering through the ruins and hanging out at the white sand beach below! Cool! When I was 16, I went on a family holiday to Cancun and we visited Chichen Itza and Tulum as day trips from there, which I really enjoyed, so I’d definitely be interested to visit the other two next time. 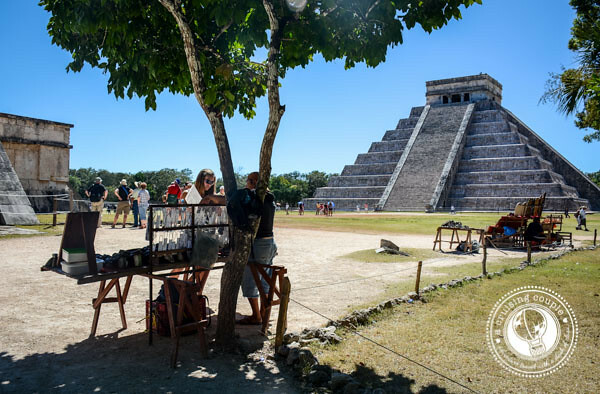 Actually, when I visited Chichen Itza, you were still allowed to climb El Castillo, which afforded you stunning views of the jungle from it, and it was easy to forget you were surrounded by loads of other tourists! Sam recently posted…Why Would We Visit Budapest in January? Great post! I’m still kicking myself for not going to Ek Balaam when I was in Valladolid in December. I was also at Chichen Itza when you could climb El Castillo (1992 before the highway!). And my pictures from Tulum the same trip have Italians from a cruise ship offshore lounging all over the ruins in bathing suits. Highly recommend Uxmal and the smaller Pu’uc Route ruins if you go back. And, Merida and Campeche. About 60% of the population of Merida is Maya. Thanks Eva! 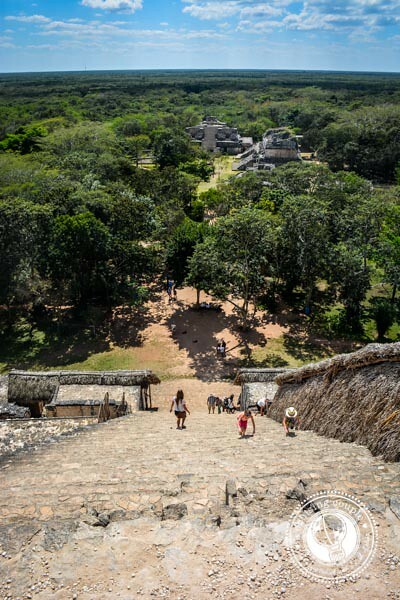 We would love to visit Uxmal and Pu’uc if we return! And Merida! Definitely so much to see in that part of Mexico! 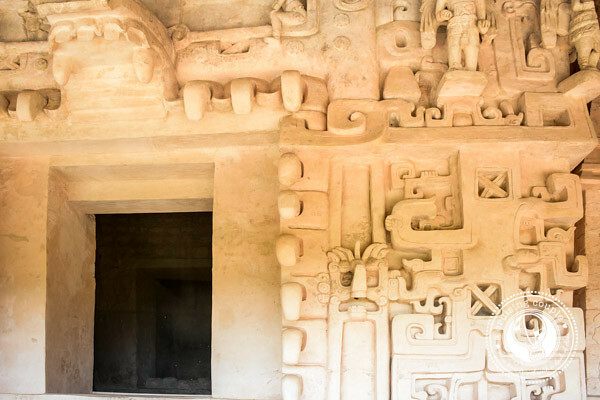 Definitely try to make it to Ek Balam if you go back- I think you would love it! Seriously! It’s a bit mind-boggling how some of the ruins can still be so intact. Judging by photos and description, Tulum would be my favourite one! It’s so interesting and historical! Thanks Agness! Great choice- Tulum is stunning. Very great shots! It shows the amazing history behind those ruins. Hope to visit the place soon. Thank you! Hope you visit soon as well! Absolutely love your pictures! Heading to Mexico in June will need to track down some of these sites! Hi, I’m going there in january (actually 31st december) in Cancun. First time in Mexico and the Yucatan. I’m also planning a visit to Tikal if I have enough time, only two weeks… I hope it will be enough. Never heard of EkBatam but I’ll try to go there. 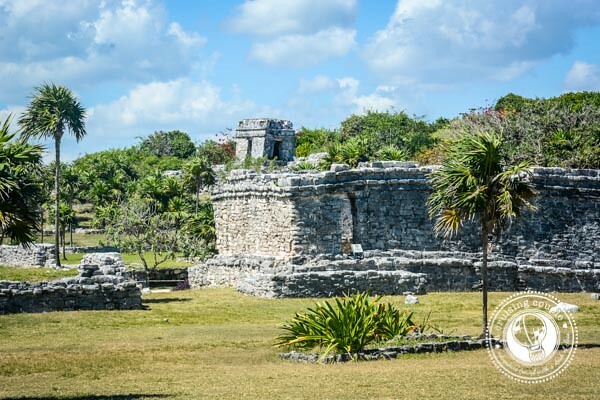 Nice pictures of Tulum and thanks for the infos. Mat recently posted…Code promo chapka assurance: 5% de réduction ! Went to Chichen Itza on a family trip. Our guide told us that we should climb El Castillo because in two weeks they were going to shut it down for tourists to climb. We feel so lucky that we were able to climb it, but I think it is probably a good idea to keep people off of it. 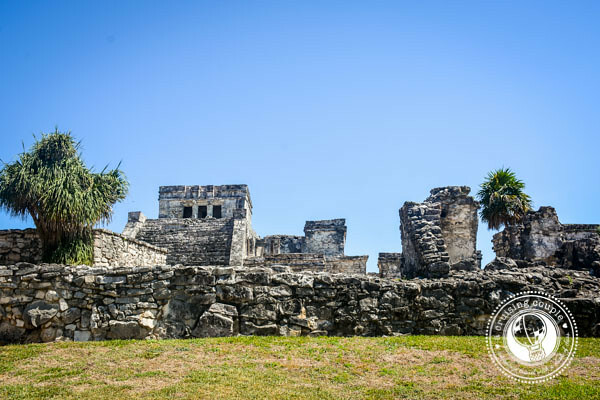 We’ve also been to Tulum and I think everyone should see these sites. Amazing in so many ways. I would love to go back to Chichen Itza and also see some of the other sites you mention. Great picks, I’ve visited all of these temples, and I think Ek Balaam was my number one also! It was tough to get to (had to haggle a taxi, no collectivo or public transit) but it was nearly tourist-free. AND you can climb the pyramid (unlike Chichen Itza). I’m hoping to try two in the southern Yucatan: Kohunlich and Chacchoben. Not sure if you’ve been there yet.